A Nestlé program in Newark, NJ that teaches parents of young children the fundamentals of good nutrition is to be expanded. In Newark, nearly one-third of children aged 3-5 years old are classified as obese – three times the US national average. ‘Nestlé/Newark Now!’ was designed to try to address this. The program, run by Nestlé and the community organization Newark Now!, helps fill a ‘gap’ in nutrition education that occurs after the first year of post-natal doctor visits and before the child reaches school age. 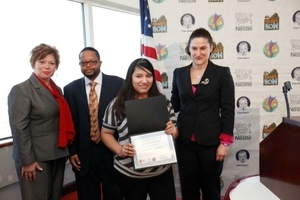 A bilingual public health nutritionist leads the sessions in community centers around Newark. Fifty-five families took part in the first year, learning about the importance of breastfeeding, how to increase fruit and vegetable consumption, healthy snacking, dealing with fussy eaters, portion control and physical activity. The curriculum was created by an advisory board made up of local nutrition and public health experts, as well as community members with experience in engaging local residents to help manage program content and activities. Starting in March, parents and other individuals who were picked to become ‘peer educators,’ will begin sharing their knowledge with hundreds more families. The Nestlé/Newark Now! curriculum draws on the findings of the Nestlé Feeding Infants & Toddlers Study (FITS). FITS studied the dietary habits and nutrient intake of 3,200 infants, toddlers and preschoolers, making it one of the largest, most comprehensive studies of its kind in the United States. The study found that children as young as 12-24 months old were beginning to develop unhealthy dietary patterns that may lead to childhood obesity. The study also revealed fruit and vegetables were lacking in children’s diets. At an official ceremony in the city to mark the next phase of the programme, Newark Mayor Booker and Deputy Mayor Margarita Muniz were joined by Sylvana Linetti, Nutrition Director for Nestlé /Newark Now, and Marilyn Knox, CEO of Nestlé Infant Nutrition. Lavar Young, President and Chief Executive Officer for Newark Now, and Dr Anyaoku Director, General Pediatrics, Children’s Hospital of New Jersey at Newark Beth Israel Medical Center, also attended.